I love the Eat the World challenge each month where Evelyne of Culture Eats chooses a Country and invites us all to make a food that originated from said Country. This month Evelyne asked us to share a recipe from England. A lot of recipes came to mind immediately. Fish and Chips, Scones, Bubbles and Squeak and, of course, Shepherd's Pie. 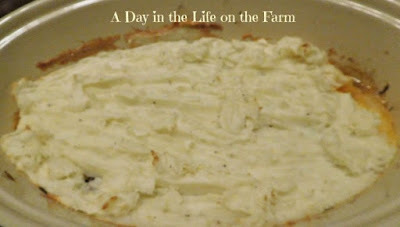 Believe it or not, I had never made a Shepherd's Pie.....I have no idea why. I will tell you that it is not the last time I will be making it. It was a huge hit....the teen ate two servings!! 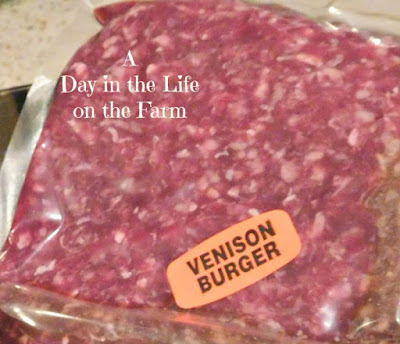 I used venison burger but feel free to use beef, lamb, chicken, turkey or whatever ground meat you have on hand. My grand niece Lili got a deer this year and shared it with me....we have been loving it. 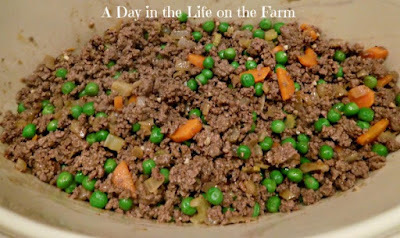 Saute up your veggies, add the ground meat and cook until crumbly and brown. Stir in your peas at the end and then transfer this mixture to a casserole. Spread cheesy mashed potatoes over all and then run a fork over them so that there are peaks that can get browned and crispy. Bake for 20-25 minutes until heated through and the potatoes are slightly browned. This may take a little longer if you made it ahead of time and refrigerated it but it should still be ready in much less than an hour. I found this recipe on the Food Network website. I adapted it slightly, using venison instead of beef or lamb, frozen peas instead of fresh, light cream instead of heavy cream and russets instead of Yukon gold potatoes. I also halved the recipe to serve only 4 instead of 8. 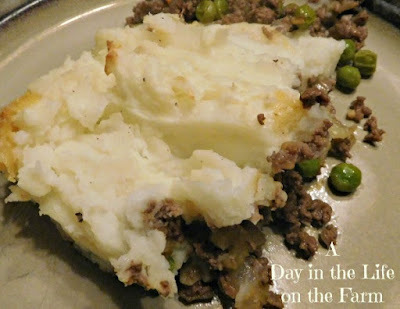 This casserole made with ground meat and vegetables topped with cheddar laced mashed potatoes is a classic comfort food. Heat 1/2 T. butter and oil in a large skillet over medium heat. Add the onions, carrots and celery. Cook until tender, about 10 minutes, stir in garlic and cook a minute or 2 longer. Add the tomato paste and stir to coat veggies. Add the ground meat, cook and stir to break meat into crumbles, until browned , about another 10 minutes. Stir in the worcestershire and beef broth. Season, to taste, with salt and pepper and stir in the peas. Transfer mixture to a casserole. Meanwhile, place the potatoes in a pot filled with cold, salted water and bring to a boil over high heat. Reduce heat, cover and simmer until potatoes are fork tender, about 20 minutes. Drain the potatoes and return to the pan along with the 2 T. butter, cream, salt and pepper. 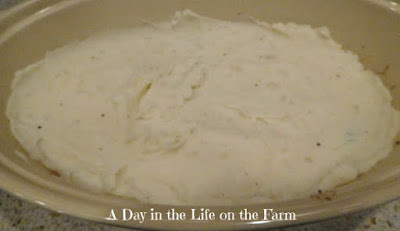 Mash the potatoes to desired consistency adding more cream if needed. Stir in the cheese. Spread the mashed potatoes over the meat mixture in the casserole. Rake a fork through the potatoes causing ridges and place into a preheated 400* oven. Bake for about 20 minutes, until heated through and the potatoes are slightly browned in spots. Adapted from a recipe provided by Danny Boone for Food Network. 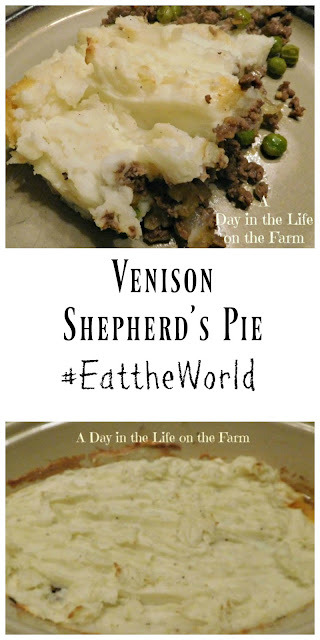 I have to say I have never used deer ground so don't really know the flavor profile but I have made Sheppard's pie with a mix of beef and pork and it was so good. I love that you used some cheddar in the potatoes and they look so velvety and smooth screaming comfort and richness. 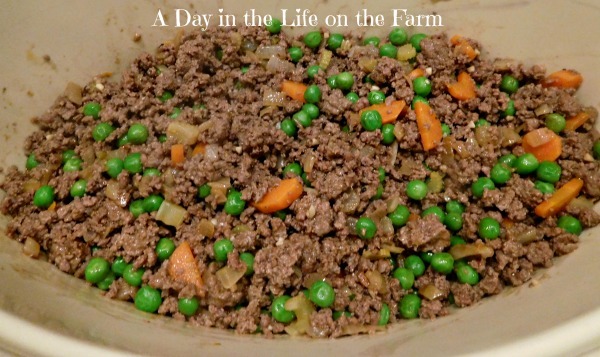 Together with your ground and veggies is a match made in heaven! We LOVE venison whenever we can get it. Thanks for sharing. I'll definitely give this a try next time I have some. Enjoy Cam...we love venison as well. Oh, yum, yum, yum. I've got some ground venison in my freezer from my sister and husband who are hunters. Now I know exactly what I'm going to do with it! Thanks for the most delicious inspiration! Enjoy Margaret, we sure did.